Threading Super 8 film with sound through the Sniper HD Pro is more time-consuming than threading silent film. 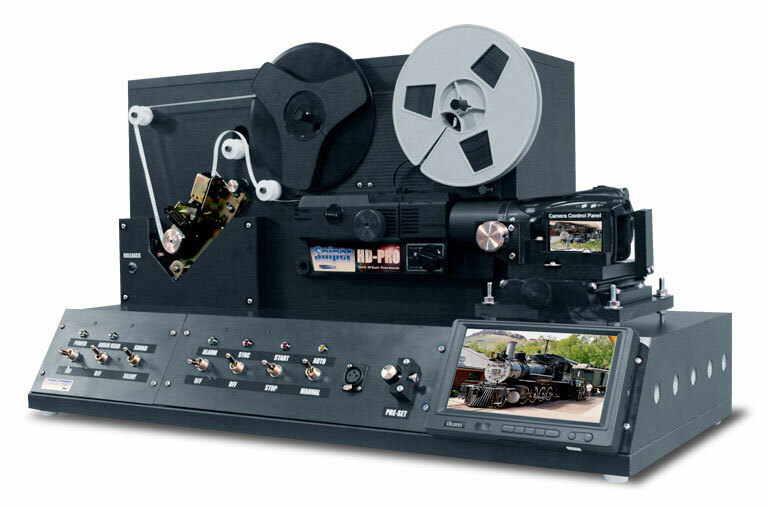 Once silent the film is pushed through the film pathway, the only other task is to attach the leader to the take-up reel. However, film with sound adds the steps of threading the film through the sound head pathway. This process needs to be precise in order to ensure good audio (an example of bad audio may be audio that's out of sync, and/or warble sounding). Also, several feet of leader needs to be added to the beginning of the film due to the distance from the film's reel to the take-up reel. Same goes for the end of the film. Since the Sniper HD Pro automatically stops when the last frame is shown through the film gate, a few feet of leader needs to be added to the end of the film to ensure all the audio is captured through the sound head. This process of adding leader is another unnecessary step for silent film. Because of this added labor, any customer that makes the special request for us to NOT splice their smaller reels onto a larger reel will incur a $5 per reel handing fee to cover the extra time it will take to process their order.